changes in the yola way to manage the navigation? I don't understand the new page manager function. there used to be a navigation table where I could easily drag pages from on line to off line to create sublink. I have one page that I would like to put on hold. How can I put that page off line without deleting it. You could press the green tick which will turn it into a red cross. This would mean that your page would no longer be visible in the Navigation. where do i write the code you gave me? The easiest thing to do is to add the image to a new page of your site and publish to the web. I can work from there for you. go on the last page to the right called 'k'. Sorry that I can not offer more assistance, this is a new feature and I have not got enough experience of it. The new Page Manager can be confusing on first view, but it is really easy to use once you get used to it. Andi has explained how to hide a page from navigation (Thanks Andi!). Take a look at this post for more details about the Page Manager. my problem is not solved. Can you help me please. thanks for your answers but it doesn't seem that simple. in the page manager table all my links are not presented in the same way. Some links have a frame around them and don't have any option (red cross, green arrow) only edit, rename and delete. why does it say that the topic is solved when it is not solved. This area does not accept code, so that is why the page is not showing on your navigation at all, thus messing up how the subpages for that page are showing. I believe we can get one problem worked out if you remove the code from the "Label" area and just put in the name of the page. Can you give that a try and let us know if this makes the Page Manager any easier to understand. I can then continue to work with you on getting things to appear as you would like. thanks. i try and let you know. It can't work. The reason why all the titles have codes in the label is to change the font. Thanks to all the codes I could have the font I wanted. I have tried and now the font of title of my page can't be changed... I am start to panic! do I have to change all my website because of this new yola set up? my problem appeared to be solved when it is not! 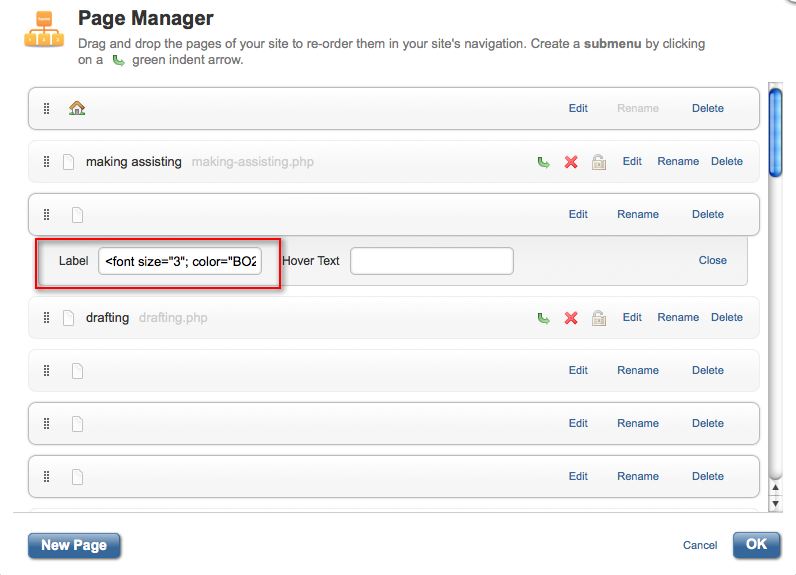 The new page manager option doesn't adapt at all to my already worked on website. I don't understand how to manage my pages anymore! problem with new navigation system!!!. Emmy, Nazlie, I am still not sure what to do. Who can I speak that could help? Can you please clarify a bit further what the issue you're having? I am not clear if you're having trouble with trying to set up subpages or if you're wanting to do something different? Are you possibly wanting to change the font of your navigation? We look forward to hearing from you and I'm sure that we will get this sorted out. as explained in the long conversation so far, I find the new navigation system doesn't adapt to how I have built my website up to now. in the previous system I could modify the pages's titles' font and color by simply adding code to their label. because of that they don't appear in the correct way in the navigation table (Emmy explained it). But If I take off the codes I can't modify the font anymore. What exactly did you want to change? I can then suggest the best code for you. I want to be able to change the font and color of the titles of my pages. Titles, as in the Navigation or as in the Headings? but Andi what do you mean? I am talking about my titles of pages. (or call them heading) If I change their font they don't appear properly in the new navigation system table and I can't create subpage or do anything to the navigation anymore. I am going a bit nut. It seems like I have describing over and over the same situation the last 3 days. Am i that unclear???? What colour, font face etc would you like for the Navigation? When we are dealing with the CSS, there are different classes, the heading and navigation. The Heading refers to the Page Title in the Page Properties Panel and the Navigation is controlled by the Navigation editor. I just wanted to clarify what you wanted to change. If possible, please could you post the code that you previously used. Remember to start the code with <!--- and end with --->. Failing that, please explain, in great detail what changes you would like to make to your Nav. i.e. Font face, font size, font colour, whether you would like it to underline when you hover over it (etc). I shall then be able to create the CSS for you. Hope you can understand all of my lists!